The answer when you don't have hours to spend in the kitchen! From deep in the heart of Texas, in the tiny town of San Saba, comes Pecan Pie in-a-Jar - an extraordinary mix you have to try to believe! Simply add eggs and butter to this delicious pecan pie filling, pour into a prepared pie shell, and bake! You'll have an amazing pecan pie in a fraction of the time. Easy to follow instructions are included with every jar. Each jar makes 1 - 9" deep dish pie or 2 - 9" pies. Approximately 10,000 pecan trees grow in a park-like setting bounded by the San Saba River and located in the Hill Country of Central Texas. 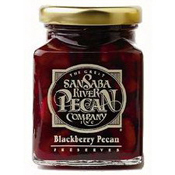 All of the San Saba River Pecan Company's award-winning gourmet products are produced and shipped from facilities housed within the orchard. In the early 1870's, Edmond E. Risien, an amateur horticulturalist, arrived in San Saba County from England. He found a light-colored, thin-shelled pecan which he named San Saba. At the confluence of the Colorado and San Saba rivers, he set out an orchard of 600 trees, using this nut as seed. He waited 12-14 years for the trees to bear fruit. Then, by a process of cross-pollination and selection, he gave the industry such pecan varieties as Onliwon, Squirrels Delight, San Saba Improved, and Western Schley. 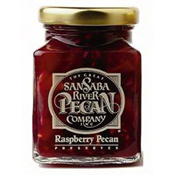 San Saba claims the title "Pecan Capital of the World". Pecans are indigenous to San Saba County and have been a cash crop since as early as 1857. Possibly some of the trees were growing here when Columbus came to America. Normal production for San Saba County is two to five million pounds of pecans per year.